You may remember some years ago, Medicare had to fix the payment system used to pay doctors. A permanent fix was passed in 2015. The permanent fix established new income tiers for Part B premiums to pay for the doctor payment fix. The new income tiers start in 2018. Below you can compare the current income tiers against the 2018 income tiers. You will see how the higher income tiers have smaller amounts thereby making more people pay higher premiums in the future. 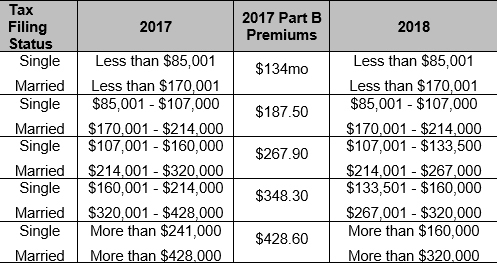 The 2018 Part B premiums are not known at this time.